April Fools’ Day as a teacher wasn’t always my favorite day. That is until I started pranking my class, that helped, a lot. We had teachers that would mirror screens in the computer lab next door and type messages to an unsuspecting class. GOLDEN. Another favorite is the old turn in your homework I never assigned. Too fun. This one however, takes the cake for me. Low-prep, disguised to not raise suspicion, this one is hilarious. 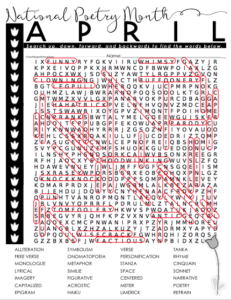 I’ve created an impossible word search, dressed in National Poetry Month clothing, perfect and completely appropriate for the first day of April. Assign it to your class, and try to suppress your giggles while they search, and search, and search, and search, and search, and search, and search, and search, and search, and search, and search for words like lyrical, alliteration, verse, simile, metaphor, and acrostic. BOGUS, BUFFOONERY, COUNTERFEIT, HAPPY APRIL FOOLS DAY, HOODWINKING, HORSEPLAY, JOKING, KNOCK KNOCK, SHENANIGAN, TOMFOOLERY, ……ETC…… plus 35 other Terms! I created two versions of the word search, same hidden terms just a variable in difficulty. The first version lacks a key. So sorry, I created this in the early hours of the morning and can’t bring myself to research each term. The second version is simpler and includes a key. Students will likely catch on quicker to the second version, so it all depends on how you would like this to play out. 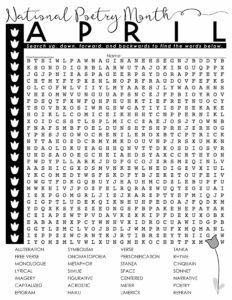 @courtneypenninton was kind enough to share some of the comments her students made while working on this pseudo word search. I almost feel bad for how funny this is to me, almost. I could not help but giggle when I read through these! These are comments from the first version of the crossword. The words Happy April Fools’ Day and all of the other 46 terms, were just talking backwards diagonals. I’m all about letting students struggle and fail just check out this Grit and Growth Mindset Bundle I created exactly for that reason! So if it were up to me, and my students were in 4th grade or higher, I’d use the first version no question! Once there’s been a struggle and you’ve all had your fun. Trust me, they will LOVE this and the relief that comes when it all starts to click! Hand out the Informational Reading Passage on April Fools’ Day. 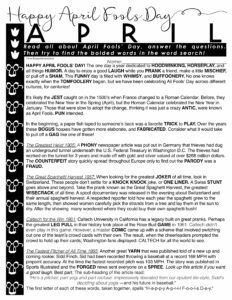 This is a really fun read that covers a brief history of where April Fool’s Day likely began, as well as a timeline of some of the greatest April Fools’ Day Pranks of all time. 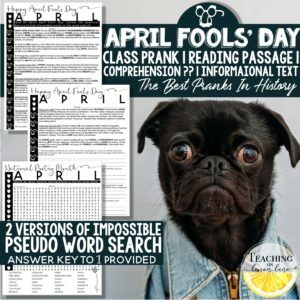 The BEST part, is that all of the bolded words from the reading, are words that the students can ACTUALLY find on their psuedo Word Search. 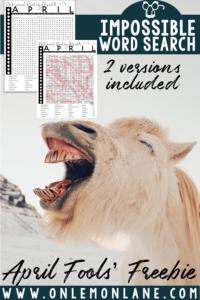 The word search itself is Free, however the reading passage and comprehension questions can be purchased here! Google National Geographic April Fools’ Day Prank to see why this Pug is rocking some Denim. 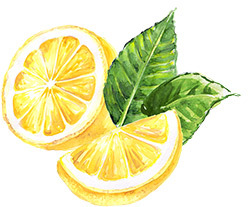 If you use this product in the classroom and are on Instagram, make sure to use the hashtag #Aprilfoolstoll (April Fools Teaching on Lemon Lane.) That way we can all giggle and enjoy each other’s stories! If you’re looking for some fun, go watch my April Fools Highlight story that showcases a few teacher’s experiences! This is honestly the PERFECT activity for April Fools’ Day and is sure to be enjoyed by all! 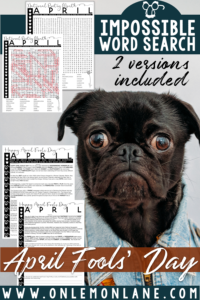 If you are interested in the ACTUAL Word Search for April, National Poetry Month, make sure to head to the click here for the FREE download! 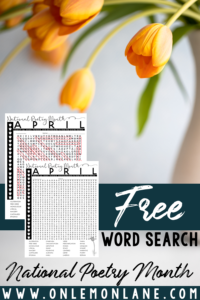 If you simply want the LIST OF WORDS that can be found on the Free Word Search, Click here!